It took a little over a week to finish the front TV project, and we (especially Paul) needed a break. We wanted to get in some sightseeing, but we just didn't feel like it. Not only that, the weather turned cloudy and rainy, so we just hung around the motor home. Our neighbors across the street at the campground had a "get to know your neighbor" happy hour over at their site one afternoon. Fortunately, they picked a day with fairly nice weather. This is their first year at Blueberry Hill, and they wanted to get to know the people around them a little better. They invited everyone along both sides of our road in the campground to bring their own beverage and a snack to share. It was great to put some names with faces of people we wave to all the time and to find out where they are from. A day or two after the happy hour, the weather turned back to clouds and rain. When the sky finally cleared after second day of solid rain, we got out our bikes and rode up to the office to check for mail and to drop off the trash. The next photo shows the front of the clubhouse where the office is located. The building that houses the library also has a card room and an area with four pool tables. We like to ride our bikes in the afternoon, and we sometimes stop in for a game or two of pool. However, we have been so busy this year we haven't ridden our bikes much. This was the first time this year we have taken time to test out the newly-recovered pool tables. The next photo shows Paul lining up an easy shot. On our way back from the office, we took advantage of the sunshine and rode our bikes around the campground. We like to check out license plates to see where people are from, and we like to see if there are any empty sites. The campground is finally starting to look full, although there are still about 15% of the sites in the front section unoccupied and at least half a dozen empty sites in the back section. In past years, the campground has been almost filled by the middle of January, and essentially completely filled by February 1; but this year the bad economy is apparently taking its toll, and there are more empty sites than in the past. We also ran a few errands during our down time, and on the way home from a shopping trip to the Villages, we passed the interesting sign in the next photo posted at the end of someone's driveway. Also on our way back from the Villages, we decided to stop at Catfish Johnny's Restaurant in Lake Panasoffkee. Lake Panasofkee is off the I-75 exit just north of the Bushnell exit. The restaurant is situated under towering, Spanish moss-draped live oak trees. Carfish Johnny's is known for seafood. We usually get either fried catfish or popcorn shrimp, but this time we both opted for fried grouper. Grouper is a member of the sea bass family. The fish is firm and has a mild almost sweet flavor. It is also low in fat and cholesterol, but the deep frying kind of cancels out that benefit. During our time of relaxation we also decided to try the new Hong Kong Chinese restaurant located in the little strip mall next to Walmart in Bushnell. There's a real international atmosphere with Little Caesars right next door. The Hong Kong restaurant seems to be primarily geared for takeout, but it has a few tables so we decided to eat in. Lunch specials are available from 11:00 AM to 3:00 PM for $5.25. The specials include a main dish, pork fried rice and an egg roll. Even though it was after 3:00, they allowed us to order from the lunch menu. We knew the dinner portions would be larger and would be much more than we could eat. We are both big fans of General Tso's chicken, so that's what we both ordered. The egg roll was pretty good - piping hot and not too greasy. The General Tso's chicken was good, but Paul thought the fried rice was a little dry. All in all, it wasn't bad for the price. And we were correct about the portions - the lunch-size meals were more than we could eat, so it's a good thing we didn't get dinners. Even though we had come to the conclusion that Margery's knee discomfort "is what it is," the outside of Margery's left knee has gotten progressively sorer with a snapping sensation whenever she sits down. The orthopedic surgeon gave the knee joint itself perfect marks just about a month ago, so she knew it had to be something else. It had gotten to the point that it was sometimes becoming extremely difficult to walk. She has been scouring internet sites like WebMD researching for possible causes, and asking God for wisdom to know how to proceed. She concluded that most likely she was dealing with something called liotibial band friction syndrome. It is a form of bursitis on either side, or lateral part, of the knee. Bursitis is the inflammation of a bursa, which is a fluid-filled sac that provides a cushion between a bone and tissue such as a ligament. Based on her research, that ligament needed to be stretched so she started doing her post-surgery leg exercises with minimal relief. Then, she made a passing comment to a shoe salesman during the above-mentioned shopping trip to the Villages, and the salesman gave her information that has proven to be the most helpful. He had had a knee replacement and experienced the same thing! Don't you just love how God answers our prayers? The salesman shared the information he got from his physical therapist...using stretch bands in two specific stretches. Margery is finally getting some real relief. We share this information in the hope it will help someone else someday. With some time out for relaxation, we are ready for another project. Look for our next post to see what we're up to. It's too cold! We're going to Florida. Hey! We're already in Florida! Well, if we're in Florida, how come it's so DARN COLD? Along with much of the rest of the country (and many parts of the world - a number of people recently died in Great Britain due to abnormally cold weather), Florida experienced colder than normal temperatures over the past two weeks. Records for cold temperatures were broken all over the state. So much for global warming. During past winters we spent in Florida, we have always hit one or two cold spells with a few nights down as low as the mid 20s. But this year, with the exception of one night when it was about 38 degrees, we have had almost two weeks straight with nighttime temperatures at or below freezing. We had one day when the temperatures didn't get out of the 30s in Bushnell; and there were several nights when it hit 22 degrees. The farms and orange groves here in Florida are struggling to keep their crops alive. Oranges are OK as long as it doesn't get below 28 degrees for more than four hours. If it gets colder than that, they sometimes spray the trees with water to form an insulating layer of ice. If oranges freeze, they can still be used for juice, but they have to be processed within a few days. When there is a hard freeze all the processing plants are jammed, and they can't process all the oranges in time. The landscape nurseries, like the one in the photo below, also spray plants with water during a freeze. This photo was taken a little later in the morning after things began to thaw, but ice still clings to the fence and grass in the foreground. Crops like corn and tomatoes can't stand frost, much less a freeze, and frost can even occur at temperatures above freezing if the air is very clear and still. Fortunately, the vegetable farms are located a little farther south of where we are, but the cold extended all the way down to Miami. There was a story on the news about farmers hiring helicopters to fly over their fields to try to blow warmer air from aloft down onto their crops. ...and on the cover for our bikes. These unusually low temperatures have curtailed our sightseeing, but Paul made good use of our time indoors to do an indoor repair project. He had been wanting to replace some discolored caulk around the kitchen sink. When he noticed a few drops of water under the sink, he realized the seal around the drain in the bottom of one bowl of the sink was leaking, and he decided to repair the leak and recaulk the sink sooner rather than later. As you can see, removing the sink required dragging everything out from under the sink, which made quite a mess in the confines of the motor home. It's been two years since Margery had partial knee replacements in both knees. The mobility she gained has truly been a blessing. This fall, however, she began to experience pain around both her knees. She knew the knee joints felt good, but was perplexed by the sometimes bothersome pain. A visit with the orthopedic surgeon last week confirmed that all was still well with her knees. The cause of the pain is unknown...bursitis? tendonitis? Bottom line is the knees will never be as good as God made them originally. It is what it is. So we will enjoy her mobility, take it easy as needed, and be grateful for the blessings of each day. The forecast is finally predicting somewhat warmer temperatures. We have friends from up north stopping by in a few days, so we'll probably schedule some sightseeing with them. Plus, we have another motor home improvement project in the works, so keep looking for our posts. It was about a two and a half hour drive from the Florida SKP Resort in Zolfo Springs to Blueberry Hill RV Resort in Bushnell, FL. We made this year's reservations for Blueberry Hill last year to take advantage of a 10% pay-in-advance discount. 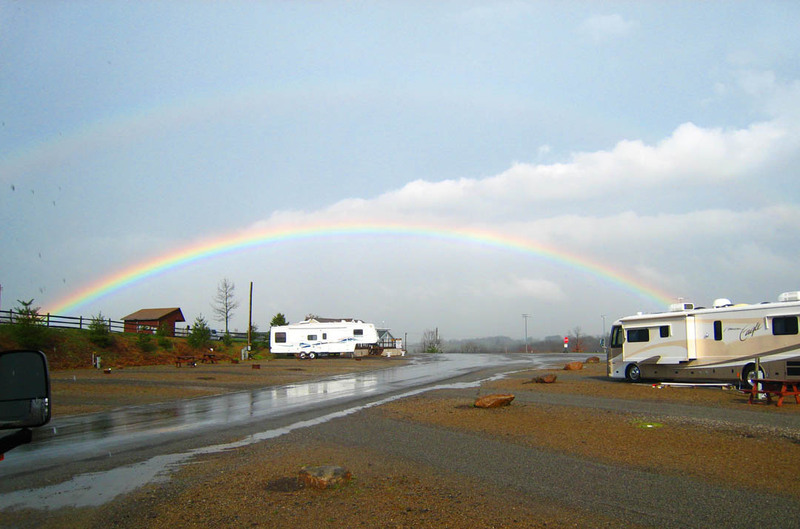 Blueberry Hill RV Resort has several hundred RV sites. The sites in front are paved pull-throughs, and the ones in back are grassy back-ins. The sites in front are usually given to those staying less than three months. We like the ones in the back because they are very spacious. The photo below shows our site at Blueberry Hill. Blueberry has full hookups with 50 amp electric and Wi-Fi. They have plenty of activities if you want them, but there isn't a lot of pressure to join in. There is a pool, shuffleboard courts, bocce, horseshoes and pool tables. There are weekly lunches followed by a bluegrass jam session with Snowbird musicians from all around the area. They also have craft classes, occasional bus trips, and various types of exercise classes. We were anxious to get settled because we had a lot to do. For the first time since we went on the road in 2006, we planned to go home for Christmas. We would be driving north in the car and staying with our daughter, Lora, and our son-in-law, J. Michael. This would also be the first time in two and a half years we would be traveling without the motor home. We are used to having everything with us, but now we needed to try to think in 70 degree weather of everything we might need to take with us for 20 degree weather. We began by making lists. Then we got our winter clothes out of storage, cleaned out the car, and eventually started to put things into piles so we could figure out how we were going to pack with the minimal luggage we had kept. Even with all we had to do in preparation for our trip to the Pittsburgh area, there was still time to do some holiday decorating. We did our usual, simple adornment of the motor home - a task that only takes a few minutes. This year, since we would be spending a lot of time in the car, Margery wanted to decorate it as well. We bought a few materials at the craft store and put together a wreath to hang on the grill. One other thing we wanted to get out of the way before the end of the year was the one-year checkup with the surgeon on Margery's knees. After viewing the X-rays, the doctor said her knees were "magnifico" and she won't need to come back for the next checkup for two years. Margery is also very pleased with the outcome of the partial knee replacements. We decided to try to see if we could make the drive from Bushnell to Pittsburgh all in one shot, so we went to bed early the Saturday before Christmas and set the alarm for 2:00 AM. This was quite a departure from our usual method of traveling only four hours a day, but we thought with two drivers and being able to make better time in the car, we should be able to make it. We threw the last minute items into the car, disconnected the water from the motor home, stowed the satellite dish, pulled in the slides to protect the slide-topper awnings in case there was a storm while we were gone, and hit the road by 3:15 AM. Traffic was very light until about sunrise, and we made good time - even on the 2 and 4-lane, non-limited access roads. As the day went on, traffic picked up. There were lots of Florida license plates heading north and lots of cars and RVs heading south. Traffic was heavy all day, but it was moving steadily and there were no delays. One of the things Margery pondered as we passed Santas decorating yards was how out of place Santas are in the south. Think about it...the heavy, fur-trimmed coat worn by Santa is way too warm for the south, the sleigh meant to travel on snow is seriously hampered by the lack thereof in the south, the reindeer who pull the sleigh are not indigenous to the south, and Santa coming in through the chimney is not practical in a region where there are few, if any, fireplaces. Hmmm. People don't seem to be very logical when it comes to traditions. It took us only a little over 15 hours to travel about 1,000 miles. It was a long day, and we were tired when we arrived in Pittsburgh; but making the drive all in one shot wasn't as bad as we had thought it might be. We went to church with Lora and J. Michael on Christmas Eve, then went to visit with J. Michael's family at his brother's house. We got to spend Christmas morning with Lora and J. Michael. The photo below shows Margery getting ready to enjoy some hot chocolate before we started opening gifts. The next photo shows J. Michael and Lora in their Santa hats. Brutus is J. Michael and Lora's boxer. He is having difficulty getting around in his old age, but he still enjoyed opening his gift of doggie treats. Using the Octapod mini camera tripod, we were able to get a picture of all of us. Among other things, Lora and J. Michael got us a Pantouch digital photo frame. It will be great to display pictures of family and of places we have been. We have a bulletin board in the motor home, but can only display a limited number of photos at a time. Plus, we have to go to the trouble of printing the photos before we can display them. The digital frame will hold up to 8,000 photos and we can download them directly from the camera or from our computer. On Christmas afternoon, we went to J. Michael's mom's house for dinner. The photo below shows some of the family just beginning to gather around the table. J. Michael's family is great, and they are fun to be with. We are gratified they are always willing to include us in their activities. On the day after Christmas, Margery and Lora hit a couple of stores to make some exchanges and to look for bargains. Summer tops aren't in high demand in Pittsburgh in the winter, and Margery was thrilled to be able to get a few for $1.40 each. Over the next few days, we played some games, watched a movie on DVD, went out to a movie, and visited with Margery's dad and Paul's step-mom. Lora and J. Michael have a Garmin Nuvi 260W GPS unit, and they took it along on most of our outings. We were amazed at how well it worked, so we started investigating GPS units ourselves. We have a GPS receiver that we can use with our DeLorme mapping software on our laptop, but we feel the computer is too big to leave open in the motor home as we travel. The computer takes up almost the whole passenger side in the car. Therefore, although we sometimes use the computer for the mapping software as we travel (even in the car), we seldom use the GPS. We found the price of portable GPS units rapidly falling, and we found a Garmin Nuvi 750 for an excellent price at Sam's Club. It is similar to the 260W Lora has so she was able to teach us how to use it fairly quickly. The name of the voice we chose to use is Jill, but we renamed her Grace because she is so amazing and hopefully we'll be reminded to have "grace under fire" when needed. The photo below shows Grace as she helps us navigate on our way back to Bushnell. Garmin also has a series of GPS units called Street Pilot which are geared toward bigger vehicles like trucks and RVs, but there seems to only be one model of Street Pilot currently being made by Garmin. The Street Pilot is also considerably more expensive than the Nuvi series (except for the newest, high-end Nuvi models). We'll just have to be careful about reviewing in advance the routes Grace plans for us when we are in the motor home. We planned our return to Bushnell for Monday hoping the traffic would be a little lighter after the weekend. By the time we packed up and said our good-byes, we didn't get on the road until about 8:45 AM. Traffic was heavy most of the way - especially for the 200+ mile portion that traverses I-95 through part of South Carolina, Georgia, and northern Florida. There were several unexplained backups on I-95 in South Carolina, and there was also a lot of construction on I-95 through most of Georgia. Although there wasn't any work going on at night, it did make the driving more difficult with narrow lanes and reduced speed limits. There were lots of southerners returning south and, surprisingly, more RV's returning north than Snowbirds heading south. We finally made it back to Bushnell about 12:30 AM. Being with family for the holidays and seeing Lora and J. Michael again was great, but It was also good to be back "home." As we approached the end of the year, we took a little time to reflect. It was a very good year for us, and we were blessed in our full-timing lifestyle in so many ways. Most importantly, we have a terrific, supportive family back home in Pittsburgh. We are happy to have been able to see them several times this year. Lora and J. Michael go out of their way to make us feel at home when we visit. We started out the year with Margery's knee surgery. Her recovery was a little slow at the start. By mid-year, she was doing well; and now at the end of a year, she is doing great. Her knees are almost as good as they were when she was younger, and they are waaaay better than they were before the surgery. Even the many steps at Lora and J. Michael's two-story house during our Christmas visit weren't bothersome. We weathered the storm of sky-high gasoline prices of 2008 by slowing our rate of travel a little. We're trusting we will also make it through the current economic crisis. We got to see so many of God's astounding creations in 2008 - the plains and farmland of Iowa, the mighty Mississippi, the geothermal features of Yellowstone, the Tetons as well as the mountains of Montana and Colorado, the azure blue skies of New Mexico, and South Florida and the Keys. We also got to see our first in-person NASCAR race. And we have met some nice people and made some new friends along the way. We used to party on New Year's Eve when we were younger. In recent years, however, we just spend a quiet evening at home watching a bunch of rented movies. We struggle to stay awake until it is time to see the ball drop in Times Square on TV. Then we wish each other a Happy New Year and shuffle off to bed. This year was no different; but with our 15-hour drive in from Pittsburgh just two nights prior, it was a little more difficult than normal staying up until midnight. We are looking forward to our time here in Bushnell. Last year, we got to do some sightseeing; but we spent much of our time with Margery recovering from knee surgery. This year, we plan not only a time of relaxation, but also some new adventures. After our two-day drive from Florida to the Pittsburgh area for J. Michael's father's funeral, we spent the week with family at the funeral home, at the funeral service, and at the memorial service. We had little time to spend at the motor home at the KOA in Washington, PA. It's just as well, because the KOA is situated on a hill overlooking the eastern end of the section of highway where I-70 and I-79 come together. Although the campground itself is fairly nice with well-spaced sites, there was a LOT of road noise. The noise did lessen somewhat late at night, but the trucks were almost constant. The campground is run by a very nice Canadian couple who retired 6 years ago and bought the KOA. After buying the campground, they went 4 years without either one of them having a day off, which is not exactly our idea of retirement. The photo below is our site at the Southeast Pittsburgh KOA in Washington, PA.
We pulled out of the campground early Monday morning and stopped by Colussy Chevrolet (where J. Michael works as comptroller) for an oil change in the motor home before we were on our way to the Amish country in Berlin, OH. Although Colussy is not an official Workhorse Chassis Service Center, they sell quite a few medium duty trucks, and they know their way around heavier chassis vehicles.  If you're in the area and need service for your car, truck, or motor home, give them a call. By mid-afternoon, we arrived in Berlin and got set up at Scenic Hills RV Park just outside town. The campground is built on three levels and only the main area by the office was open when we first got there. The photo below shows our site. The owners of the campground were hard at work spreading gravel, grading, repairing, and mowing getting ready for larger crowds that spring would bring. Scenic Hills is located beside a lumber mill that does planing and kiln drying of lumber. There is some noise from the dust collector at the mill; but, since the mill doesn't operate on Saturdays or Sundays, the noise is not a problem on a weekend visit or if, during the week, you're away from the rig most of the day sightseeing. However, we were still recuperating from the flu and surgery and planned to stick pretty close to home so the mill and the back-up beepers on the fork lifts were a little bothersome. By the second week of our stay, they had opened some of the sites in the other areas of the campground, so we decided to move to the lower level where we awoke to chirping birds instead of back-up beepers. The photo below shows our site on the lower level. We considered heading a little farther south for a while looking for warmer weather; but with the rising cost of fuel, we decided to stay put since we were planning to head back to the Pittsburgh area at the end of April for our originally-planned visit with Lora and J. Michael and for the doctor appointments we had previously scheduled. There were a couple of nights down in the upper 20s and two dreary, rainy, windy days in the 50s; but, especially for April, the weather really wasn't all that bad. We were treated to a beautiful, bright rainbow after one rainy afternoon. Berlin is one of our favorite locations because we like the rural atmosphere, the well-kept Amish farms, and the delicious food that is available. We went there last year after leaving the Pittsburgh area in August. 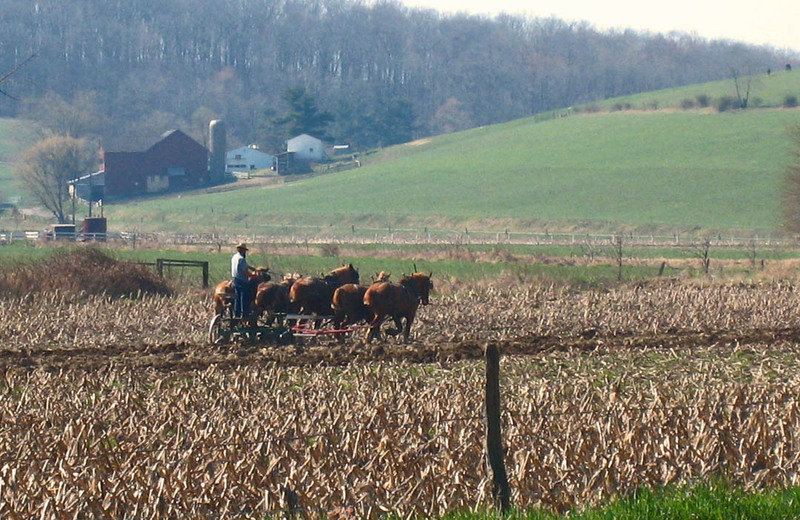 This year, we got to see fields being plowed in preparation for spring planting. Lora and J. Michael drove out for the day while we were in Berlin to meet us at Der Dutchman Restaurant in Walnut Creek for breakfast. 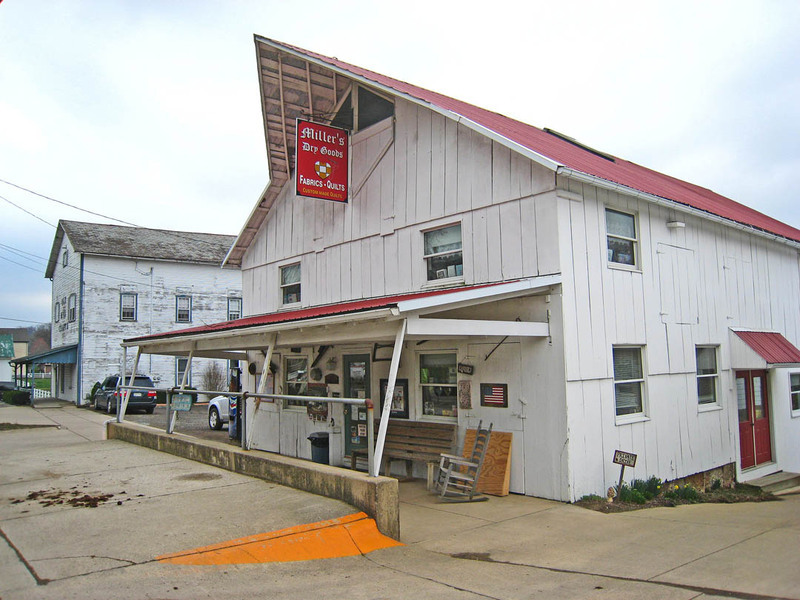 While they were there, we stopped at the Amish Flea Market and at Lehman's Hardware, where they sell many non-electrical appliances for the Amish as well as many hard-to-find tools and farm items. 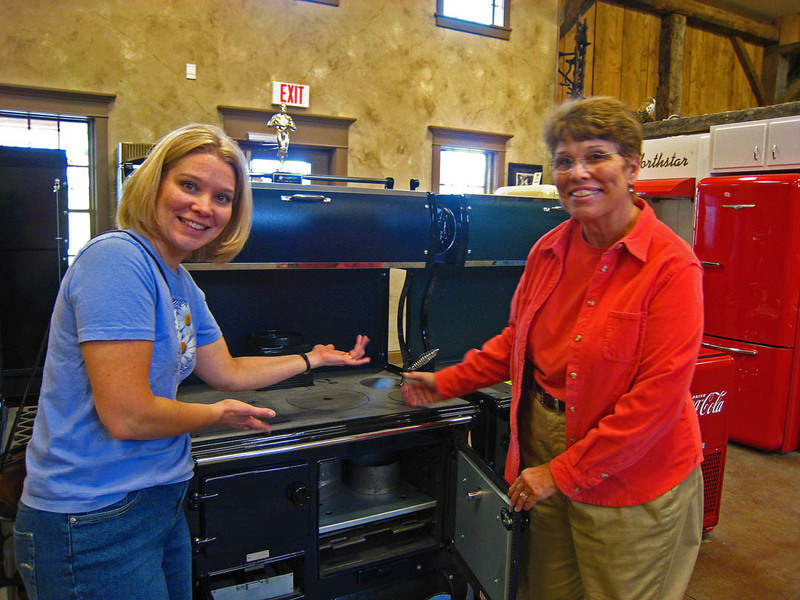 The photo below shows Margery and Lora as Barker's Beauties doing a "Price is Right" showing of a wood-burning kitchen stove. We made many of our favorite stops while we were in Berlin, including several at Der Dutchman Restaurant. 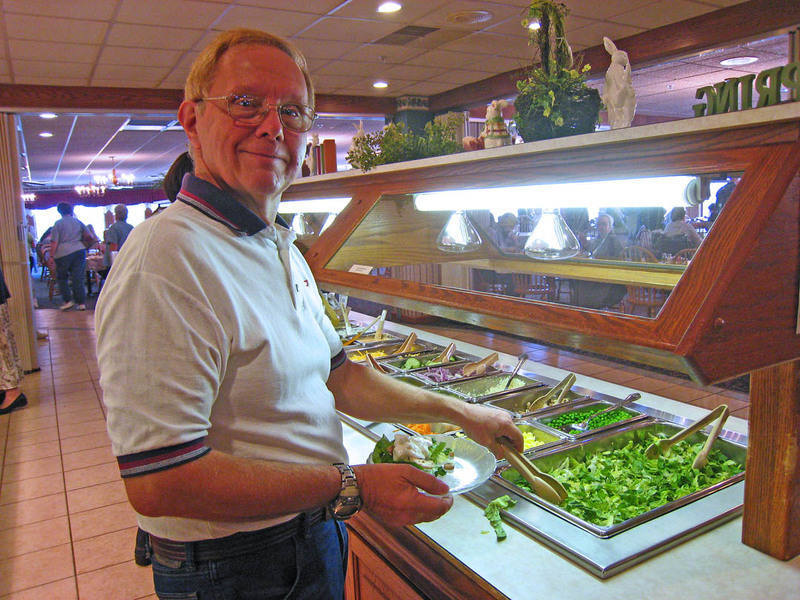 We love their breakfast buffet and their salad bar. The photo below shows Paul starting to load up his plate. Stops at Sugar Valley Meats for smoked beef jerky and ham loaf mix, at Heini's Cheese for jalapeño yogurt cheese, and at Winesburg Meats for beef sticks were also on our schedule. Did you notice how many of our favorite places involve food? 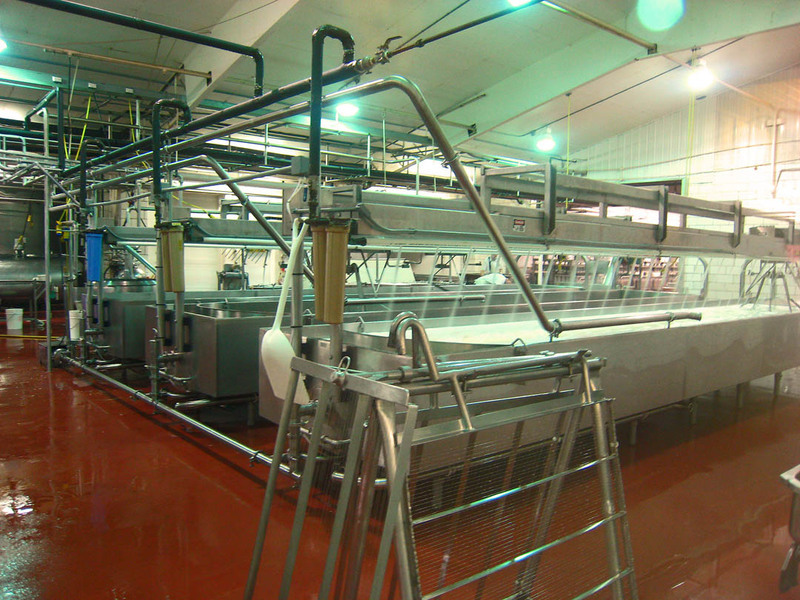 It was a treat to visit Heini's during the week when we could actually see the cheese being made. The fun thing about Heini's is that they provide cheese samples for almost all of their cheeses. 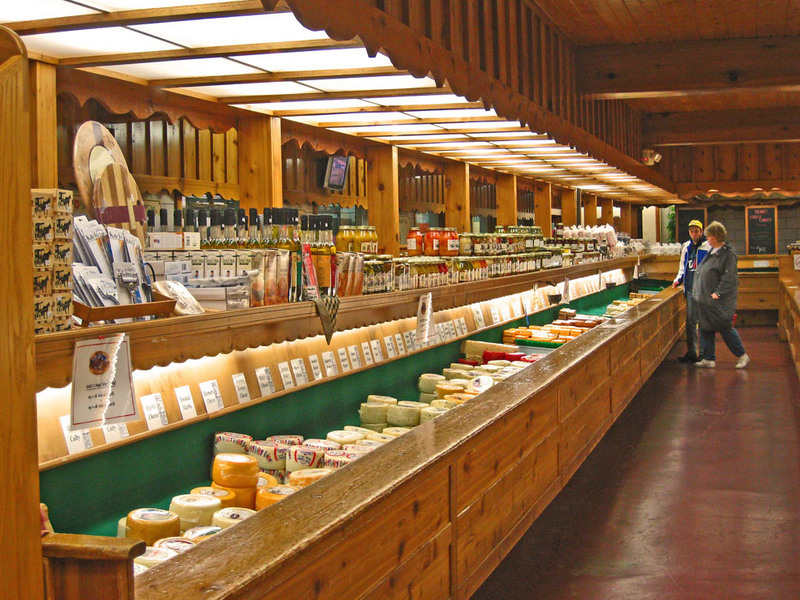 On the weekends, you just get in line and slowly shuffle your way around the store munching cheese samples as you go. During the week we could move unhindered. 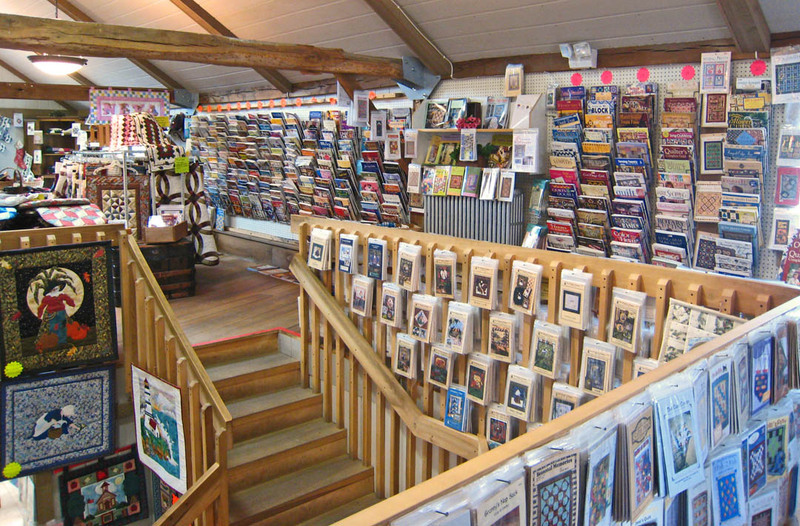 ...that has loads of pattern books and stencils. 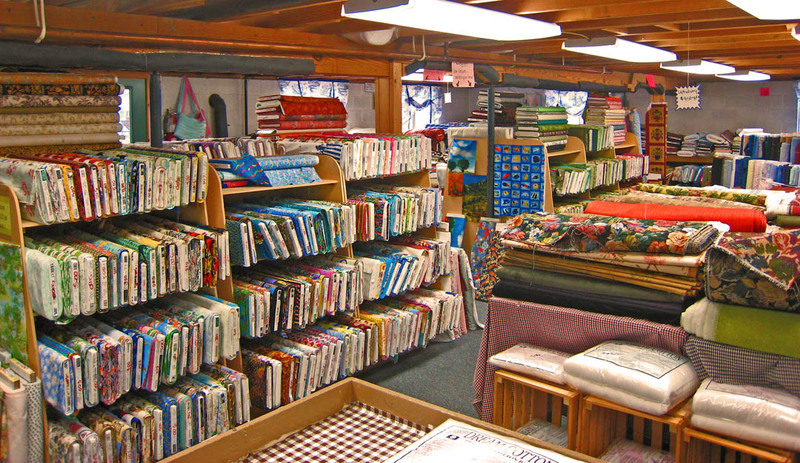 ...and a basement filled with fabrics on sale. 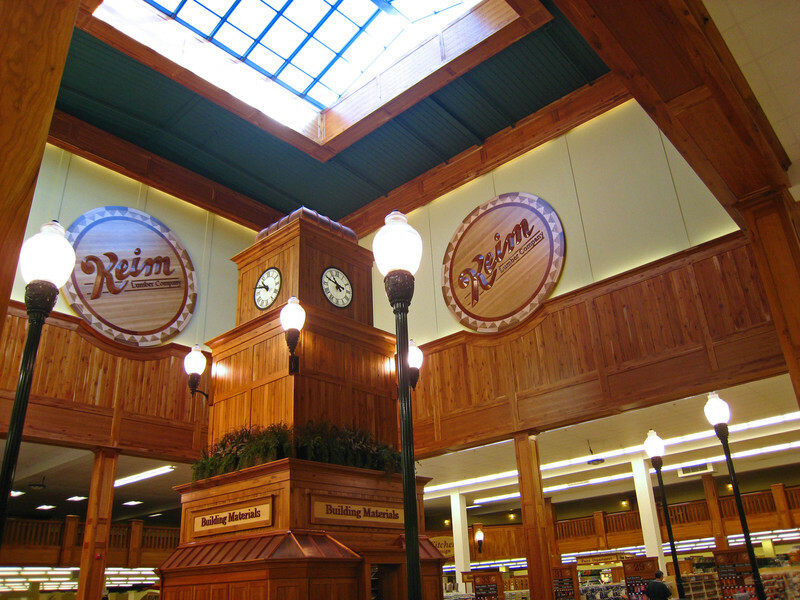 Who would think the little town of Charm would also have such a large home and lumber center as Keim Lumber? 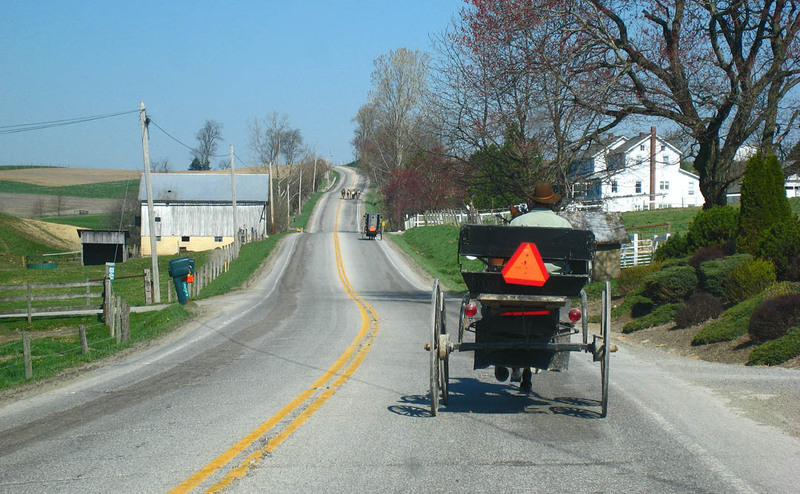 Holmes County, where Berlin and Charm are located and which has the world's largest concentration of Amish, is a huge area for woodworking and the Amish are quite good at it. Many Amish farms have signs at the end of the driveway advertising furniture for sale. There are dozens larger furniture shops with almost any type of wood furniture, most of it locally made. Holmes County also has numerous mills rough sawing lumber as well as shops doing kiln drying, planing, and making custom millwork. We're not sure where they get all the trees! 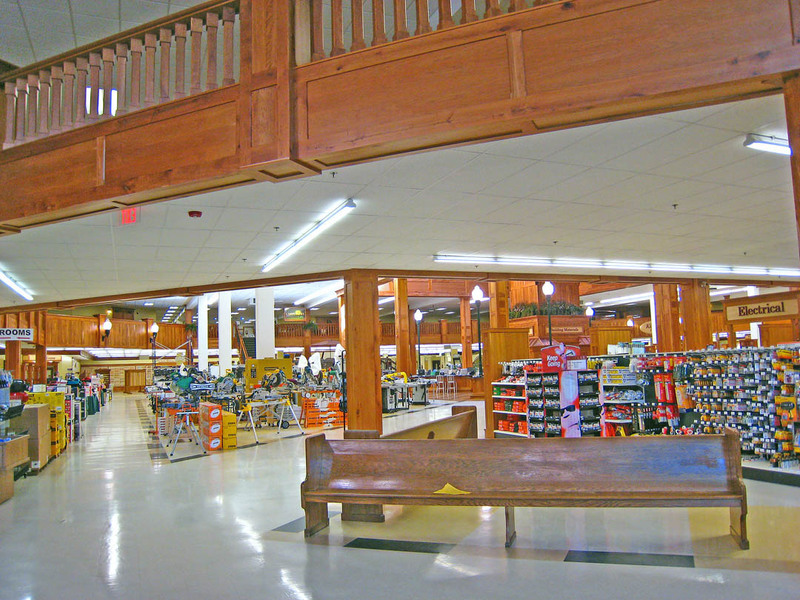 Keim Lumber not only has most of the usual selection of home building and remodeling supplies and tools; they also sell professional-grade woodworking machines to many of the mills and furniture shops. 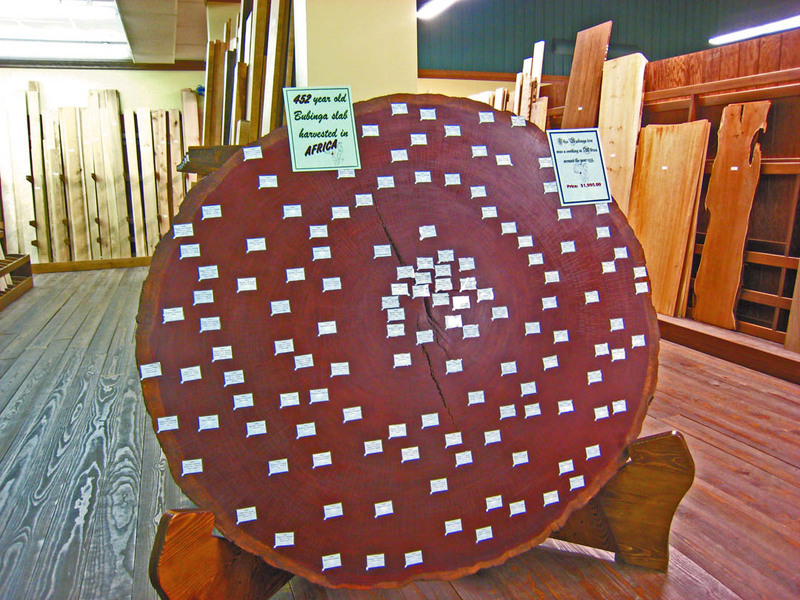 In addition to construction lumber, they have a huge selection of hardwoods including a wide variety of exotic woods from all over the world. 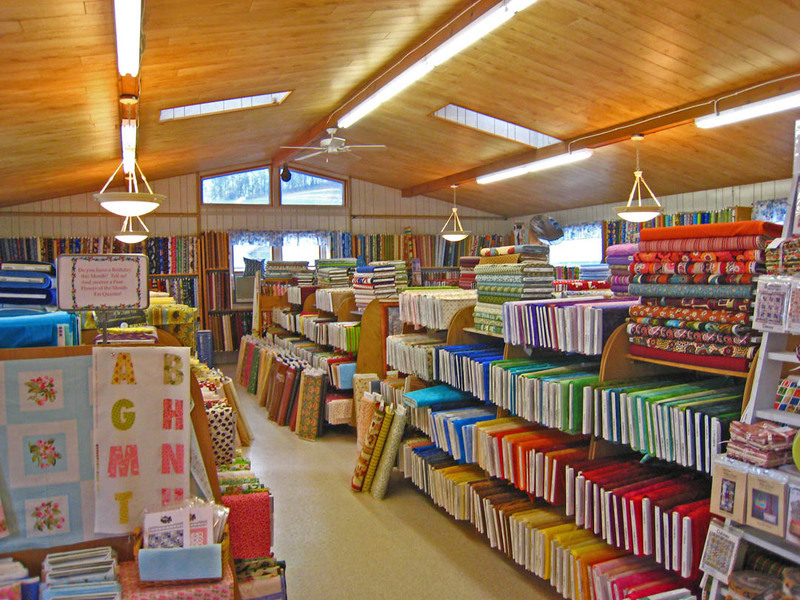 They had remodeled since we had last visited, and Margery particularly found the store jaw-dropping. The woodwork decorating the store itself is beautiful. 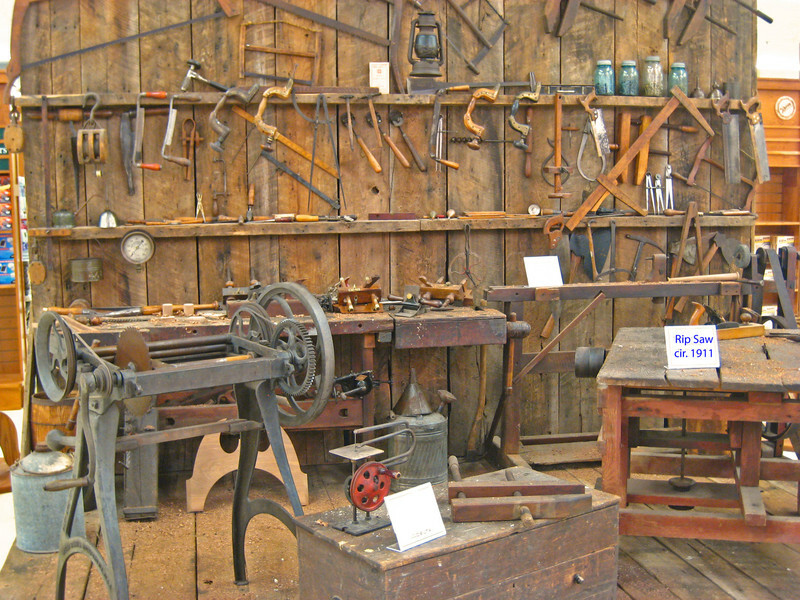 This is a display of antique tools including the first rip saw used in 1911 when the Keim Lumber first opened. 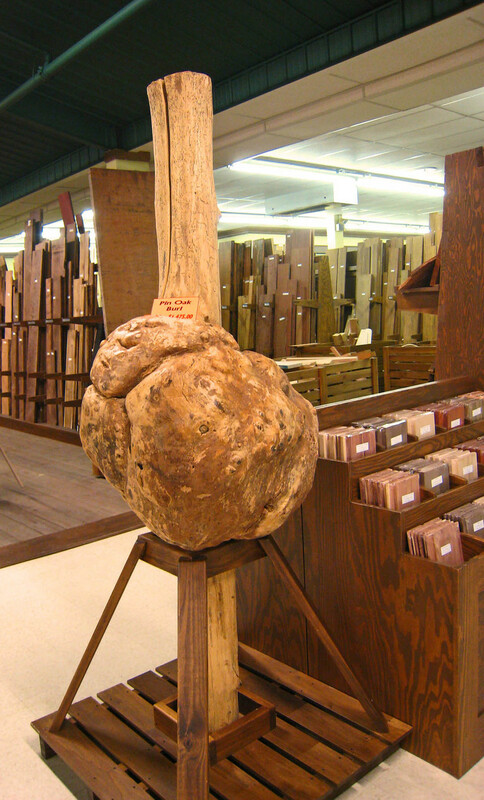 Next to their exotic wood department, there was this large burl available for just $475. Burls like this are prized by woodworkers for the highly figured wood they contain. This 452 year old Bubinga slab was harvested in Africa. The Bubinga tree the slab was taken from was a seedling in 1555. The slab is available to the first $1,995 that is offered. Each paper square relates a year and a world event. This has become a destination home and lumber center. Refreshments are available at the Carpenter's Cafe on the mezzanine. On the way out of Charm we drove up to these buggies. Notice the team of plow horses traveling up the road off in the distance at the top of the picture. Like many travelers, Wal-Mart is our store of choice for grocery shopping. It's interesting to see how the grocery items can vary from one part of the country to another. In the southwest, Mexican ingredients, both fresh and canned, abound. Here in the northest, we can find canned three-bean salad and frozen pirogies. In Florida, Wal-Mart has a large stock of wines including Childress wines of NASCAR owner Richard Childress fame. 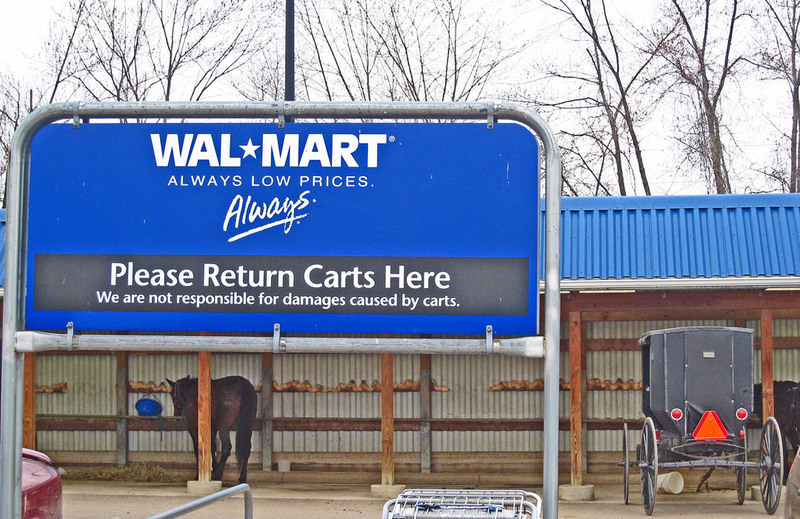 However, the Wal-Mart in Millersburg was the first one we've visited that included a hitching rail for the Amish buggies. And it was interesting to see the Amish using debit cards when checking out. Plans for our summer travels are beginning to take shape. We registered for the Escapees Escapade in Gillette, WY in July with the intention of going to Yellowstone and the Grand Tetons afterward. We are hoping our fuel budget holds out. 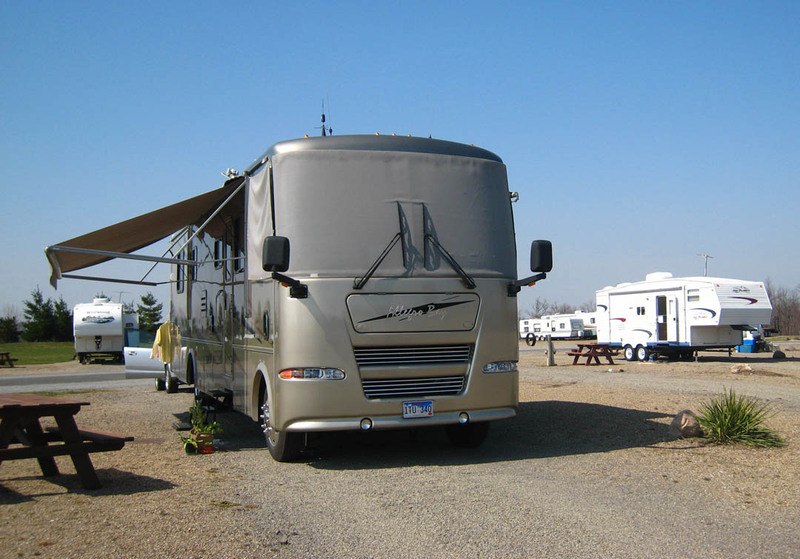 Escapees is an organization that supports RVers, especially full-timers. Their rallies are called Escapades. We attended an Escapade our first year of full-timing in October, 2006 and we enjoyed it. Since 2008 is the Escapees' 30th anniversary, we thought we would attend again. 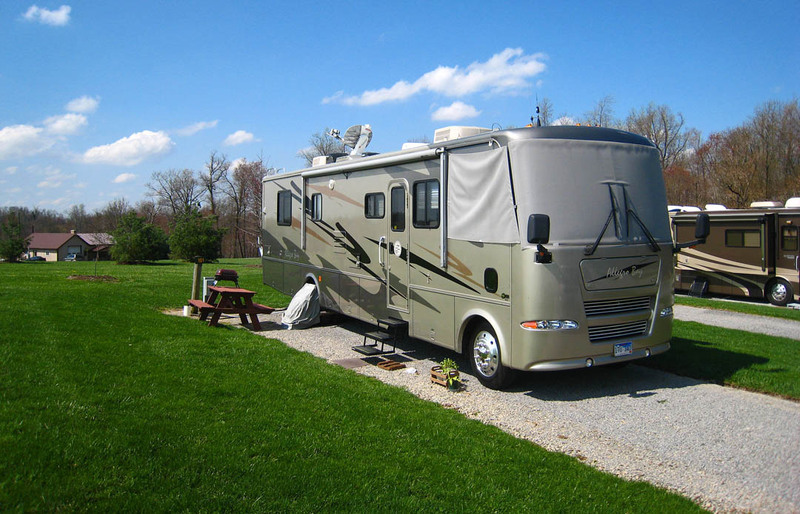 The Escapades have seminars including topics on lifestyle, RV maintenance and repair, and hobbies. 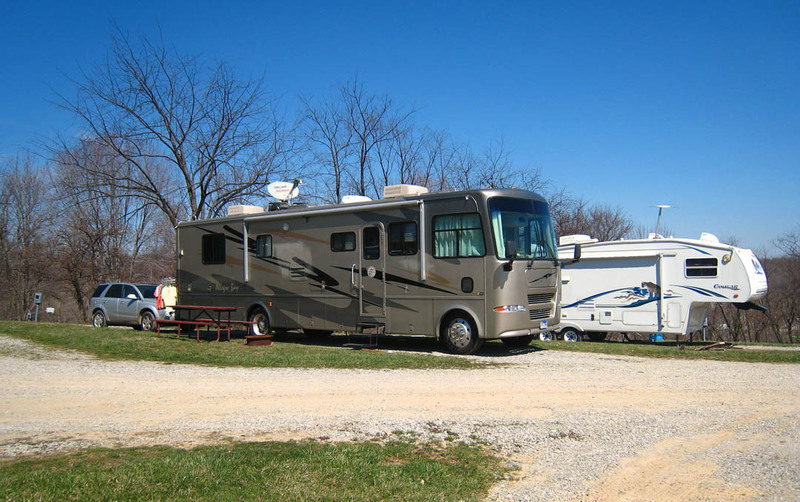 They also have entertainment, a market area for vendors of RV-related products and accessories, and plenty of opportunities to meet other RVers. Margery's knees are doing quite well. She is able to make it through a complete shopping trip around Wal-Mart and still stand in line to check out without having to stop to sit a few minutes. We started taking a couple of medium-length walks around the campground just about every day with the plan of gradually lengthening the walks so Margery can build up stamina by strengthening her leg and thigh muscles. We're looking forward to some of the easier one or two-mile hikes at Yellowstone. From Berlin, it will be back to Pittsburgh for another short stay, then we will take our time getting to Gillette for the Escapade.